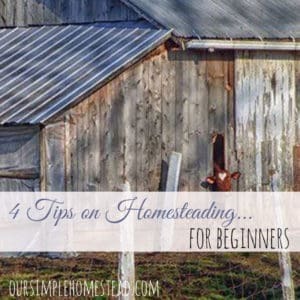 I wish I could say that self-sufficient homesteading was an inexpensive way to live, but in all reality, the initial start-up cost of setting up a homestead can be very expensive, and the learning curve can be steep at times. We had a dream to move to the country and live a more self-sufficient lifestyle for many years before it actually happened. We had to sacrifice our living conditions and alter our dream many times along the way. 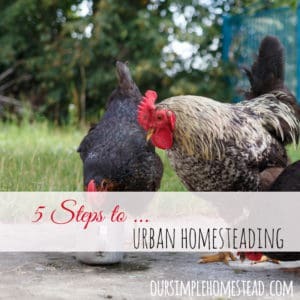 I do not want to discourage anyone from following their homesteading dreams, but I do want to write this post in a very open and honest manner so you know what to expect. 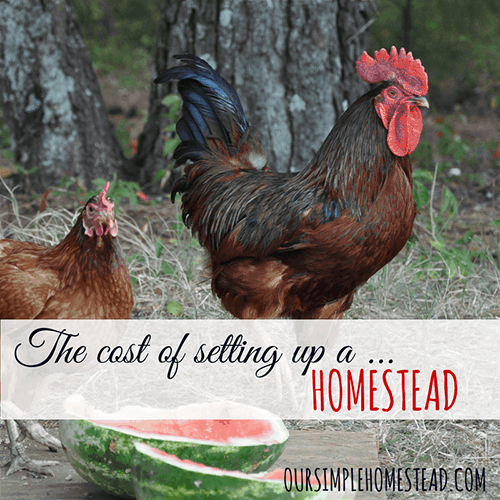 I know it is not socially acceptable to talk about how much things cost or how much we spend, but I do want to give an accurate look into the cost of setting up a homestead. If I am going against what is acceptable in your eyes, and you have no desire to know these things, please stop reading here. What we have learned in the last few years is that whatever we purchase ends up paying for itself in the long run. We do not have large savings to go out and buy whatever we need, and we make our purchases slowly over time. Larger items are saved for or bought with overtime hour money. Smaller items are purchased paycheck-by-paycheck depending on what we can afford at the time. Any livestock feed is figured into our monthly budget, and we do not raise more animals than we can afford to take care at any one time. The same goes for building our homestead; any improvements made are done piece-by-piece, one paycheck at a time. Land – 21 country acres.We live 30 minutes from the nearest town. Home – 1,200 sq. ft.We had to live in a camper for two years to save money for a down payment on the house. $80,000 (mortgaged) – After using all of our savings for the well and septic we had to save more and dip into our retirement for a down payment for the house. We downsized from a 2.500 sq ft house in the city to a smaller home that forced us to purge items we had collected over the years. With it came a freedom from owning less. Barn – 192 sq. ft. mini barn is still holding up but will need to be replaced before adding any more livestock or farming projects to the homestead. $3,000 – We build this one paycheck at a time while living in the camper. In our area, we can build this size outbuilding without having to get a permit. Stores tools, livestock feed, lawn and garden items and building supplies. Henhouse – Holds 12 hens and one rooster. Our egg hens free-range most of the year, so the upkeep on this house has been very minimal. $2,000 – We build this one paycheck at a time while living in the camper. The fresh eggs we get are shared with our adult children and their families, our neighbors and friends. We love sharing! Tractor – 1950 Ford – An antique by many standards our 1950 tractor has plowed fields, built a driveway and planted corn. $1,600 – We used a tax return to make this purchase. $500 – Repairs to the radiator, tires, battery, and water pump. The joy hubby gets when he spends the day on his tractor is better than any vacation he could ever pay for. Tractor Implements – Very used planter, back blade, box blade, rake and single plow. $1,000 – Purchased from a friends grandfather who allowed us to make monthly payments for 3 months. These tractor parts have been a big help in preparing our soil and taking care of normal farming chores. Army Surplus Trailer – I am not sure what we would do without this trailer! $400.00 – Paid for with overtime money. Used for hauling straw, wood and building supplies. Three Rabbit Pens – We raise and butcher about fifteen meat rabbits three times a year. $100 for wire fencing and built with leftover wood from building the barn. We raise all our own meat and never have to buy meat from the grocery store. We always know what is in or meat. Meat Chicken Coop – We raise and butcher two batches of meat chickens twice a year. $300 Pen – Paid for with overtime money. $70 a year for chicks. If you have never tasted a freshly butchered chicken you are in for a treat. The flavor is amazing. $200 – To keep the coyotes from killing our meat chickens we had to buy and install a poultry net electric fence. Pig Pen – We raise 2 feeder pigs each spring and butcher them when they are about 7-8 months old. Their pen is 20 x 120 with a covered area to sleep and get out of the sun. $600 Pen – Bought supplies one paycheck at a time until we had enough supplies to build the pen. $90 for two feeder pigs. $500 a year for feed. We supplement their feed with table scraps and garden waste. 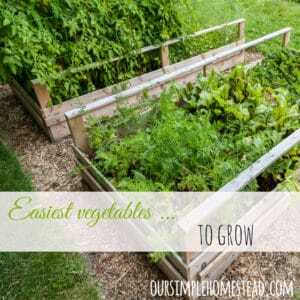 Vegetable Garden – To grow enough vegetables to feed our family for a year we have to put a lot of time and money into the garden areas. 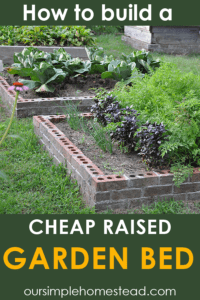 $1,500 – This cost covers lime, fertilizer, seed replacement, canning supplies, extra water usage, gas for tractor, raised beds, irrigation, fencing and overwinter crops for a year. The produce we put up each year keeps our pantry stocked all winter long. We preserve about 300 jars each year. To keep the chickens out we had to build a cheap wood picket fence for $200. 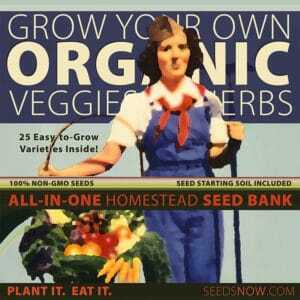 Homestead additions – We continually add to the growth of our homestead land. We budget about $500 each year to grow. This includes planting new trees, grapes, berry bushes, landscaping, and irrigation. We see the fruits of our labor grow each year. Even though we have a limited budget for growth we do see our land gowning in value each and every year. Tools – Living on a farm and homesteading requires that you have basic tools at your disposal. Over the last few years, we have purchased over $5,000 worth of basic tools, such as a lawn tractor, rototiller, weed eater, chainsaw, axes, wedges, saws, shovels, picks, forks, post hole digger, wheelbarrows, fencing, and building tools. There have been times when we needed to borrow items but we have a good network of other homesteaders we can borrow from if needed. 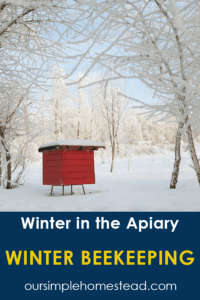 It is all about helping out your neighbors and forming a homesteading community. Bees – One of my favorite things we do here on our farm is raising bees. We had some trial and errors when we first were learning how to care for our bees, but each year our hives get better and we pull more honey. Over the last three years, we have invested $575 in bees, and $500 in hives, foundation and bee clothing. Not to count the unexpected emergency room visit for a bee sting reaction. The golden honey we get to pull from our hives twice a year is worth more to me than any diamonds or gold and girl could ask for.We have three hives and average about one-gallon honey from each. Pasture – As our homestead continues to grow we are always having to add pastures. Fencing is a big job and requires more than money, it requires strength and stamina!Who needs a gym when you have to pick up 200-40# cedar fence posts? $1,500 – It took us almost four full weekends to install 1900 feet of fence.We used 4″ woven fence with cedar posts. We cemented in the corner posts and have two 10″ gates installed. There is a sense of accomplishment when we pull in the driveway and drive past all those lined up cedar fence posts. Long hours, sore backs, and lots of fun doing a big job like that together. Alpacas – A dream come true!Adding these adorable alpacas to our homestead has been a long time plan. As with everything else on the homestead they must earn their keep. We raise them to sell their fiber. The feel of their fiber between my fingers while spinning their fleece. The snuggles and kisses they give our grandchildren… priceless! I can do without the spitting, but it is a small price to pay for the joy they give us. This is just a peek into the cost of setting up a homestead. We started with a blank piece of land that had no outbuilding or home already standing. The land had not been lived on or taking care of for over 20 years. The land was overgrown, in bad shape, and had no nutrients left in the soil. Over half of it was an open field that had no trees, no water and no source of power. We started from the ground up and have been building little by little each year as time and money allows. What are we saving for and planning for the next five years? Finish sunroom – $3,000. Completed above budget. Actual cost $8000.00 and it took us two years to finish this project, one paycheck at a time. Solar additions for power sources- $5,000. Completed above budget. Actual Cost 18,000. Rebates from Federal & State of $12,000. Choose to make monthly installments which are in the place of our regular power bill. Beef cows $2,000. Completed under budget. Actual cost $950.00 for two heifers and one bull. While homesteading can be very tiring at times, the satisfaction we feel at the end of the day is priceless. We continue to live frugally and recycle, reuse and make do with what we have to continue living this lifestyle. 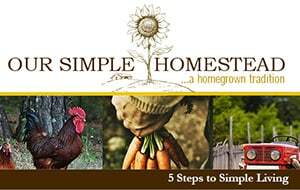 If you would like even more resources about starting a website be sure to visit 15 Acre Homestead article on Starting a Homestead. I would move to the country in a second! My husband says no though. LOVE your way of life. You can bring a touch of country to you by just adopting some simple living tips and ideas. If your heart is in the country then bring the country to you. I appreciate the authenticity and transparency about finances. Why is it so unacceptable to talk about these things? I think we learn the most from this kind of honesty. You said everyone earns their keep. I would be interested in earnings from, especially, the Alpacas, especially since they seem quite expensive, compared to other costs, to raise. This post was so helpful. We are new hometeaders and it is so refreshing to read real life experiences. So much of what I see is fairy tale thinking about the joys of country life, without any of the work behind it. I appreciate your forthright approach. Ruth you are so right…there is a lot of work that goes into living in the country and on a farm, but the joy of it makes it so worth the back breaking work that it takes! Great post. I love how you break everything down and give the positives to all that you have done. Thanks for sharing so openly. Thanks Shari…I know when I am doing research I want to know all the details not just a few off the top. I had to think long and hard if I wanted to open it up so everyone could see into our finances and I am so glad I decided to go ahead, I am getting good feedback. Thanks for the costs breakdown. I am planning to homestead, it is my life dream. Maybe with in the next 5 years. It is so expensive just to live. Starting to prepare now. yhanks again. Don’t let your plans overwhelm you…just take baby steps. There are so many things you can do right now to help get you started. We’re just getting started and renting the land (hope to buy one day) but the initial costs have been high. It’s definitely an investment! Thanks for the cost break down! Jennifer I am so glad it helped you and I hope it gave you some insight to the actual costs of homesteading. WOW! I didn’t realize in other parts of the country things were so expensive. I know when we started looking for land we did have go to another county because the land and taxes were cheaper. Had we still had little kids at home we may not have been able to do that since where we live now the school system is not as good as it is closer to the city. I would have had to home school to keep them from going to that school district. Have you looked into surrounding counties? Hi Tracy. This is a great post. You say you looked at other countries? That’s what we’re doing now. We are trying to figure out how to do it, though, as we have no savings …living paycheck to paycheck. To get legal residency there, one has to be there for six months (on visa) and then another six months on a work visa. It’s SO tedious! But the land cost and cost of living is well worth digging deep in the internet and books and any other source I can come by. Thanks for this post. Cristina I meant county not country. I didn’t look into moving to a different country. We did move to a different county because the taxes were cheaper. Have you checked in different areas in your current area? No our intention is to leave the U.S. entirely. Just too much going on and it’s just so unfriendly. The climate has changed so much that it’s just a big rat race. We have always planned on retiring somewhere tropical and we’ve found the perfect place: Belize. American speaking, American dollar, but with cultural diversity and unadulterated land. We are so happy about that. We are planning on starting small: Some chickens and maybe rabbits. But after seeing a video on clipping the hooves of goats we are scared! We also are very interested in Beekeeping but in the Caribbean the bees are Africanized so they’re far more hostile. Still the same principle though. Thank you again for this great article! Such good information. My husband and I are following in your footsteps. We have the well, septic tank, fruit and nut orchard and our travel trailer all waiting for us to sell our house in the valley (soon, I hope) so we can move into the trailer and begin building our new home on our new homestead! We have followed a pay as you go system. We found out the cost of the well, saved for it, then got it. Same with the septic and the orchard. We have also paid off the land. So far we don’t owe anything and (hopefully) will build our new house from the equity of the sale of our current home. That’s the plan, anyway, but we still have quite a few more purchases to make and buildings to build like a chicken coop,and a barn/ shop/garage. Let’s hope my husband’s pension or Social Security or our saving’s account don’t go belly up before we finish! When we started our goal was to build our own house on the pay as you go method but my hubby works out of town so much he never had time to do anything. We had to give into having it built for us but if we had to do it over we would go back to our original plan of doing it our self. Best of luck to you! Thank you for sharing your costs. So often on the internet you see people doing/getting things for almost no money and it doesn’t make sense to me. It makes me wonder, how can we be doing things so wrong? We were lucky enough to find a local contractor to build the 2nd half of our barn and add windows(it was a 3 walled shed) for $3000, giving us a total space of 30*20 for our animals. But if I tell people we spent that amount money they look at me like I’m crazy! I usually then tell them my cellphone is 3 years old, I wear clothes I’ve had since high school and our idea of a fancy date is $16 for breakfast once a month a the local diner. One of the reasons I posted the actual costs was I am always researching to get a ball-park figure when we start a new project. I can never find a true cost of things and it frustrates me. I am really hoping it helps someone! I love your fancy date for $16! Our fancy date is tonight…we are driving the pick-up truck down in the field, taking a picnic and going dove hunting! We are together out in nature and we love it. No noise, no over priced meal, and no traffic! We have spent more in some areas and saved in others. Thanks Sandra! Glad you stopped by! I would love to try and raise sheep but it is so hot here in South Carolina I am not sure if they would enjoy it! Sounds like you keep pretty busy on your farm. Please feel free to ask me any questions you have about canning I would be more than happy to help! What a great post! We’ve set up a homestead once and are looking to move again. We need MORE LAND:)! I think you should bump those beef cows to the top of the list;). Thanks Kristen I am glad you found it useful! Great article and thank you for writing it! I’m working on getting and building up my own homestead now but I am choosing the debt free approach with it. Chris good for you! It is such an accomplishment when you stand back and look at all your hard work, and even more so when you know you did it debt free! some places it will be a BIG nut to crack and swallow. Karen thank you so much for your honesty and opening up what it cost you to set up your homestead. I realize the cost will vary in each area of the country. All I can do is post what it is in our area and hope everyone realizes their location may be different. I SO appreciate your candid openness about the costs of homesteading. While this lifestyle may be costly to some, I think some people forget that bigger city homes may cost more and city taxes are most certainly more costly. And city lifestyles are more costly to keep up! I lives in the city for 27+ years and we moved to the county 14 years ago. Our cost of living is less here than it was before. We started off slowly adding projects while my husband still had fulltime income. Our two big goals were to pay off our home and get my husband retired. While we did have a number of unexpected and unplanned expenses (a new septic and drain field 3 months after moving in-YIKES!) we have met our goals. I figure you pay now (for homegrown healthy foods that are organic) or you pay later in ill health and doctors bills. Given a choice, I’ll pay now and eat organic and non GMO foods! LOVE your site, I always learn something new. Donna at The Small House Homestead in SW Michigan! Thanks and keep up the good work! Donna you sound a lot like us…we started off slow and add projects as money allows. There are always going to be set backs and it is how you handle those moments that counts most! Thanks for sharing your story with us. I’m in the very beginning planning (dreaming?) stages of starting up a homestead. Your post was super helpful in getting an idea of the costs involved. Thanks!!! Farmer Brad I am so happy this post helped. When we first started homesteading we looked all over for something like this just to give us a place to start. So I’m curious with your land, you bought 21 acres- but how much of it is used for gardening? Great information. One question: what kind of work and how much is your annual income? I know this can be a private thing, so you don’t have to answer. But looking for a comparison on time etc. Good job and thanks for posting. !!! I don’t mind answering that at all. My husband is a Drilling Manager and I am a Web Designer by trade. I work mainly on the farm, but do take on a few web clients now and then to help my husband with our finances. Our combined income is less than $60k a year. We are pretty much debt free except for our mortgage and a car payment. We do not use credit, grow most of our own food, recycle and reuse all that we can, and research our local classifieds, farm papers and Craig’s List for anything we need to buy. Thanks for stopping by and I am glad this was able to help you plan your homesteading adventures. Thank you for posting this with such honesty. So few people discuss the actual cost, let alone break it down per expense. As a result I’ve had alot of difficulty planning my own move down into the country to start my own homesteading adventure. So thank you again for opening up about your expenses regarding this. It’s one of the most useful articles I’ve read on homesteading yet. Thank you Anthony. It was the same for us when we started…we searched and searched for resources that told us the facts like we needed them and could never find any. Everyone skirted around the cost and it drove me crazy. I am so glad this post is helping you! I am 34, with 2 young children, and what you are doing is my life long dream. However, I know no one that does this and have no one to talk with on how to accomplish it from virtually nothing. Please, if you have time, I would love to ask you some questions. I entered in my email address above. I would be very grateful if you would email me, so I can ‘pick your brain’ on your experiences. Thanks, again!! Charity I will email you…. Thank you for posting this! I’ve been looking for real figures for a homestead of this size as I’ve been in the market for land. By my calculations, you’re around $240,000 in expenses after a 15 year period, but the house, land, all structures, and all livestock would be cared for. Plus you’d be improving the land every year as you describe. By this same figure, I have your yearly expenses at about $16,000 (plus personal expenses such as electric, water, phone, internet, etc). Is this far off from what you’re currently seeing? It seems that one full time income should be able to support a homesteading family, and that the homestead could be used for profitable ventures to recoup some of the costs (thinking of raising meat birds or layers, or perhaps a few more pigs). All in all, this post has greatly encouraged me in my venture. Thanks again. Ryan I am glad this post gives you some real time figures to work with. I know the cost of things won’t be the same across the board, but I am hoping it gives everyone a ball park figure to start. Your figures sound about right and we have been able to do it on just my husbands income. I was working full-time until recently, just to pay off the last of our debt, but now I am no longer working outside the farm and we are managing fine. We do bargain shop, recycle and reuse, always by used and raise and can most of our own food. That really helps us being able to live off one income. I work the farm during the week and my hubby does the heavier things on the weekend. We are slowly turning our homestead into a working farm in hopes that by the time my husband retires it will help support supplement our income. Nobody uses growth hormones for chickens in the U.S. For one it’s illegal and it’s been proven over and over that it is not cost effective. Please stop perpetuating the myth that there are “those companies” using growth hormones. You’re doing nothing but instilling a greater fear into people who have no ability for critical thought. Thank you so much for letting us know that! 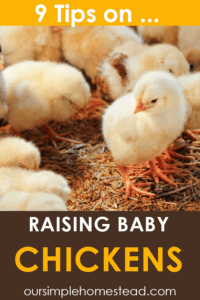 I had always been told that chickens were given growth hormones…it is so refreshing to know that they are not! The majority of chickens raised and sold in the US are in fact given growth hormones. pd is obviously a shill for the chicken industry. No. It’s ILLEGAL. They’re not allowed to use them and, like the other commenter said, it wouldn’t be cost effective. If you buy the same hybrid birds that the factories buy, you can also grow huge, meaty 10 lb birds in eight weeks. No growth hormones necessary. And if you grow them at home, on grass, with fresh air, you’ll get healthy birds that don’t need antibiotics. Homesteading, today, isn’t what it was years ago. My grandparents moved from town to the country in 1948, where the government said that if they successfully homesteaded a piece of land for 5 years, it was theirs free and clear. I don’t believe there is anything offered like that, today. Wow…that would be awesome if they still did that today! Thank you for the post. My husband and I live in town, and have added things over the years like fruit trees, berry canes, gardens. And we built our own chicken coop. We will be moving to a small town in the mountains to help his mom, and will continue to do what we can. Not everyone can afford to or be able to move to the country and homestead on the scale you do, but everyone can implement at least a few self-sufficient practices, even if its just a tower garden on the patio of an apartment. Thank you again for this article–lots of good info in it and on your web site. I couldn’t agree more! 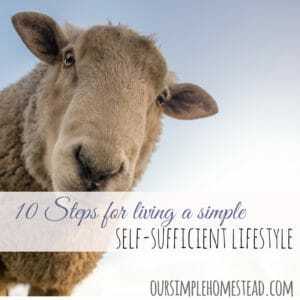 You can homestead and be more self-sufficient anywhere you live …it is all in your mindset! Thanks for stopping by! Our goal as homesteaders was to become self-sufficient and even though we are not selling things from our farm we supply three families with farm fresh produce, meat and eggs on a weekly basis. Hi Tracy,I’m working on a project to get people to see that it doesn’t take a whole lot of money to get you going.Via my website.I spent many and one days and nights combing over different articles and reading so much ideas on homesteading and gardening and living off grid,etc.You read where people had some sort of good paying job and they left the job to go to the country.Well I’m going to be truthful here,you don’t.We got very lucky and ran across a place that had a doublewide mobile home(run down and needs fixing)on an acre of land(11,000.00)financed..So far we have managed to grow a small garden (35.00)(this is our first year) and I bought 2 rain barrels,10.00 each.Compost bin(free) made of pallets.For the first year it has been an experiment to see what will grow and I had huge success.I grew tomatoes,peppers,peas,and loofahs.The loofahs had to be trellised and that was 20.00.We done work when we could afford it.Next year all this is going to be 3xs as big and can’t wait.We’re putting in a smokehouse and chicken coop!I’m here to tell you,you can do it on a small income. I have been considering goats…thanks for the information. Thank you so much for breaking down the costs so much. I found it very informative. We have been looking for property in our area (N. CA) but land is sooooo expensive and building ordinances sooooooo restrictive! So, we are thinking out of CA! any suggestions? Julie I know what you mean! When we first looked for land the county we lived in was the same way. We had to move to a different county in order to afford land. We had to make a few sacrifices to make it work. My suggestion is to check on surrounding counties and be open to having to move to a more rural area to be able to make homesteading work for you. Thank you Tracy! we’ll keep looking! your story is very inspiring! Hi! I’m so excited to find your post! My husband retired from the Navy 3 years ago and we stayed in the area of his final duty station to allow our children to finish school with friends. We’ve moved several times over the last 20 years! Also, over the last 20 years we’ve experienced sever all deaths in our family. Anyway, we’ve been blessed to inherit 6 of the 12 acres I grew up on. My husband and I have prayed and feel that God is leading us to go back to our roots and homestead. I couldnt be more excited and my husband is quite excited tempered with a lot of anxiety! We have put a down payment on a used travel trailer to live in while we build. We are planning to have a large metal building built. We will finish half of it for our living quarters and the other half will be garage/shop/temporary stalls for our first few critters until our barn can be built. I was curious about what kind of septic system you used. We will be moving to south east TX. We are leaning toward the concrete septic tank. What are your thoughts? Do you have any good links? Thanks so much for sharing! Oh! The best part is my sweet sister will be my neighbor to the west and my uncle will be my neighbor to the east! We are all planning on farming together. It’s really special because we lost our Dad this past June shortly before he turned 64. Life is too short to live and run the rat race just to buy stuff! Thanks! Cindy how exciting! I remember how excited we were when we bought our land in the country. We lived in a travel trailer for two years well we saved for the house. We installed a cement septic system and I think they are allt he same but I really don’t know any details about it. Your plan sounds perfect! I love it! So inspiring to see you did not give up and you kept the faith! Notice how long this topic has stayed ‘alive’ in the comments! I very much appreciate that you took the time and were willing to convey the real costs you incurred with your endeavors. Hugs to your hubby too. I just literally gave away my 28-bird chicken flock (most raised from eggs or chicks), and their coop (sold for $400). It was too big a feed bill (especially comparing for what we could buy in eggs at the store), but I loved having a flock for 5 years. Your costs testimony persuaded me to add up feed costs…and I was SHOCKED~! For 28 birds, 1 bag of layer pellets a week at $16.50 = $792. a year!! (In SW Colorado). That is just simply cray-cray (as they say)! If I had sold more cartons of eggs it might have completely offset that cost and still afforded us the fresh & rich eggs (and the whole experience of keeping chickens and feeling self-sufficient), but the truth is that winter comes and there are less eggs unless you provide straw bedding, light and heat.. and there go your profits again! So, keeping animals or even a flock of chickens for eggs or meat is NOT a means to being self-sufficient unless you also grow the feed in a sustainable way (not buying seeds or needing loans for equipment etc….). To get to that point is a very long haul of time, and as you are doing, in increments over that time (buy a shed to keep the hay and straw with the money you earned -over the costs- of selling half a beef cow or something). Maybe I’m a little despairing of ‘the dream’ at this point, but the topic of costs is very important, and we need to discuss them even more. Thank you so much for your great insight and it adds to the overall value of this post! Is there such thing as “modern” homesteading? Do you have electricity, running water, etc? Obviously having a 1950s tractor doesn’t imply you’re not using modern conveniences but it still begs the question. Homesteading seems like an awesome way to live, but its a lifestyle that requires being self sufficient but I am curious if it is possible to defer certain work to hired hands (say for butchering and fence installations, etc) Granted doing that means more money has to be spent. Shannon what a great question! Yes there is such a thing as modern homesteading and I would say we are somewhere between “modern and off grid.” We do use electric, but do all of our own butchering and farm maintenance. We raise and can most of our food and always reuse or make do with what we have before buying anything new. We live pretty simply and live as much off the land as possible for us. I’d love to have you share this and a few of your posts with us over at Country Fair Blog Party, you’d be a perfect fit! It’s a once a month link up, so feel free to come link a few posts and join us! Thank you so kindly for giving me some insight into Homesteading and costs, I have entertained thoughts about owning 10 acres of land, growing some fruits & vegetables, maybe some alpaca and a few other animals to start. My 2nd Great Grandfather purchased and owned hundreds of acres of land back in the mid 1800’s into the 1900’s. He started from scratch, cleared the land that had lots and lots of trees, and made a very profitable and well known farm for himself and family. They did homesteading back when homesteading was a way of life for the majority of people, it was just a normal way of living. He served in the civil war and was a farmer all of his adult life. After he and his wife passed away and the land was passed down to the 2 kids, with the sister giving her share to her brother (my Great Grandfather), he sold the land to invest in a hotel, therefore there was no farm passed through the generations that trickled down to me, so maybe this is where my passion for homesteading comes from. I am wondering if the government allows you a break on federal taxes if you raise the Alpaca because I have read that there are certain animals that if a person raises, the government will give tax breaks? Is there anywhere on the internet that you know of that I could get more info in regards to raising certain animals and getting any breaks on tax returns at the end of the year? I also wondered if you all sell any of the fruits/vegetables that you grow at a farmers market or there at your land? I would like to eventually be able to have a small farm market there on my land and have a place where people could come in the fall and get pumpkins and cider. etc. This way my husband and I could both live from the land and earn our living from our land instead of trying to run a homestead and having to work a regular job? Last question would be… do you have any experience with applying for grants to help start a farm/homestead and if so do you have any suggestions or info on that? Thank you again for all of the info you have given, it is indeed very helpful and I wish you and your family the best in your homesteading. Dawn it sounds like homesteading is in your blood! To answer some of your questions…we have never taken any tax breaks on raising our alpacas. We only have three and raise them for our own fiber use only. We pretty much grow vegetables and raise livestock to be self-sufficient and there is rarely anything left over to sell. I have some homesteading friends who do grow extra and set up each week at a couple farmers markets…they do ok. Your plans to have a farmers stand on your property is a great idea! We live so far out in the country we don’t have enough street traffic to justify a roadside stand. I wish I could give you some help with applying for grants, but again we homestead mainly to be self-sufficient. This is a very good post! I’ve never seen anyone be so open with their finances. Thanks for sharing it is very much appreciated. Ever so interesting! I think the reality of the actual amounts, above or below budget, how you paid for things, and all, really opened my eyes. I am almost 70 years old so will not be starting over your way, but at one time in my life, I had that desire. Thanks for sharing. Love this. This is great! My husband and I are in our 4th year of homesteading/small-scale farming…It is crazy how fast the “small” cost projects add up. Thanks for posting your numbers in such detail and thanks for sharing on the Homestead Blog Hop! Tracy this is one of the most interesting posts I’ve ever read. I can only imagine the pride you feel in what you’ve accomplished. Blessings to you and your family as you continue the life of your dreams. Thank you for sharing with us this week at Celebrate Your Story, and I hope your week is going great. Great info! Thanks a bunch! On the topic of finances, any idea what your cost is of items you do have to buy, which aren’t farm related? _ like shoes, or supplements, trash bags, toilet paper,…that sort of thing? Trying to work out a realistic budget for things we’d always need, even with the animals and gardens. We try to keep things real and work into our budget a cushion for things like clothes and new shoes. We are a small family and I can keep our grocery budget at $100 a week with a $50 cushion for misc items. Please, can you tell me How to Buy Land Very Cheaply? 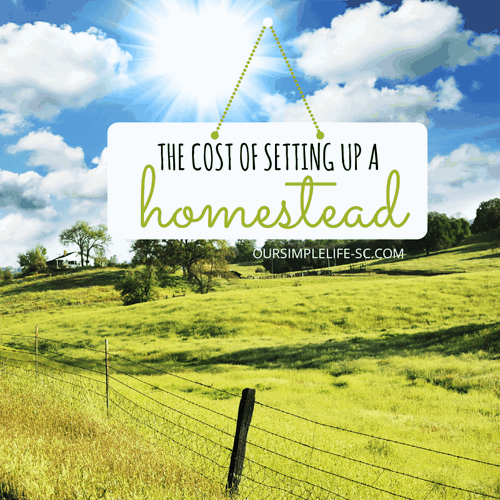 Love your article on the costs of Homesteading. Your land sounds a lot like ours. Our home is in Arkansas. We purchased our “retirement” home (25 acres of long neglected land) with a 5-year-old 3 bedroom home, heated 1600 sf garage, a potting shed, a hay shed and a paddock, so you can imagine our mortgage. We purchased it in Feb. with the plan to retire in July of the next year. God had other plans. In August after buying the farm, my husband had a major heart issue and take disability leave from his job as a minister. Being in the ministry, if we had not purchased this home, we would have no place to live. Anyway, now we raise chickens for eggs, and pigs, chickens, and beef for meat. Our son lives nearby and acts as our farmhand and manager. We have plenty to eat, but must still buy vegetables. Land still needs to be amended to grow them. That is this year’s main focus. We supplement our income by selling our proteins at the local Farmers Market. This helps with feed and other farm expenses. The best thing about this is being able to give our produce away. But there is nothing like awaking to the happy clucking of chickens! thanks for sharing your post. loved reading your story… This is just kind of a side question? Do you use the oils with your chickens? I see Perdue is putting oregano in the water… Do you do anything like that? We just got chickens, and are feeding them organic feed. Wondering about. Oil in the water? Maria, I have not but some of my homesteading friends have. I really thank you for this info and for sharing your personal life and info with your readers. I have read most of the comments and they are so right!!! No one mentions the cost of Homesteading. Which leaves folks like me wondering how they are doing what they are doing. I know many have land that was passed down to them, and many are very skilled in areas of building. But I do understand even with all that it still takes money. This is a great starting point in conversations I will have with my husband and we start our 5 year journey to our small farm/homestead.